The Aurora Series round concrete trash cans are extremely durable outdoors and are also part of a family of matching planters and benches. These trash cans offer steel reinforced construction for maximum durability and minimum maintenance. Their sheer weight deters theft and vandalism. Available in many colors and finishes that blend with the outdoor environment. Rigid plastic 22 gallon liner measures 14-1/2" Dia. x 30"H and is sold separately. 22 Gallon Liner Sold Separately. 5,000 PSI Minimum Compressive Strength. Spun aluminum lid is secured with a vinyl coated cable, and can be powder-coated with any of the colors shown in the lid color options. 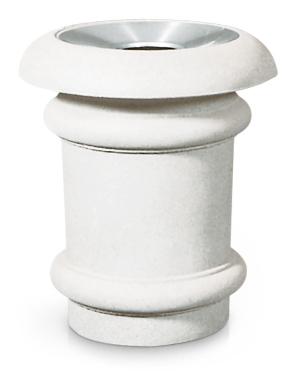 This round precast concrete trash can is available in Light Sand Blast, Etch, Perma Stone, and Dura Brite finish options, and is treated with a water-repellent sealer for ultimate weather resistant durability. 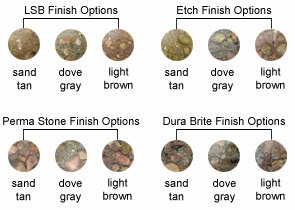 'Slate Stone Etch' color upgrade options available with model numbers ending with '-CUS1'. 'White Matrix' color upgrade options available with model numbers ending with '-CUS2'.